Below are just few of my opinions on practicing plays, stretching before practice, and warm up. When approaching a practice, you can have a few different philosophies. First off, you can concentrate more on one aspect of the game. Assuming an hour long practice, you may spend 45 minutes on offense and 10 minutes on defense (allowing for 5 minutes of water breaks). Another approach is to focus on practicing plays over and over so your team becomes very efficient. Assuming 8-9 kids are at practice, with this approach, you have 5 kids line up in a formation and run a play while the other kids sit out. After each repetition or a few reps, you rotate the players in and others sit. I try to keep the kids as active as possible. Most of the time, I’m the only coach and it becomes hard to keep kids who are sitting out from goofing around while trying to instruct the kids running the play. My approach is to try to simulate segments of game situations and try to maximize repetitions during practice. What this means is that if I have a play where the first option is the Quarterback rolling out and throwing to a receiver running a quick out. Instead of practicing the whole play over and over where only two kids are actively involved. I will just run this segment of the play. We’ll start the drill with 2-3 QBs, 3 Centers, and the rest at Receiver. Once the first group of three is done, the next group is ready. We get several reps in a short amount of time. 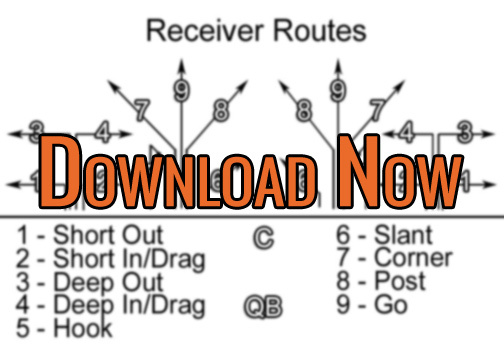 Another example is how I would practice the running play below. This play can be a force in your offense at younger ages (through 8 years old). This play starts as a simple fake one cross and hand off to the other. Taking the “practicing plays” approach, you would line up 5 kids in the formation and run it. Then, either rotate positions, players, or run again. It may take 30-40 seconds to get the kids lined up again and ready to go. Over the course of 5 minutes, you may only practice this play about 8-10 times. Depending on the number of kids at practice, I split them up into groups. Because the wide receiver in this play basically does nothing, it’s wasted time having a kid practice this. With the group 4, have the kids line up with a center, quarterback, and two running backs. Have both groups line up at the same time and tell them, fake left, run right. Then, on your “Hike”, both groups execute the play and line back up. While it will still take 30-40 seconds to get lined back up, you have 2 groups going at the same time and no kids are sitting out. This also helps because 2 quarterbacks are getting reps instead of one. With a group of three, you can eliminate the center/quarterback exchange and have the quarterback hold the ball as if taking the snap. Do this when you want to focus on the running back movements and the QB/RB exchange. After a few reps, add in the center. While it will slow down the drill, the Center-Quarterback exchange is essential to practice as well. Depending on your team size, you can run drill with 2-3 groups simultaneously. Once your kids become familiar with the drill and how to line up, you can lay out cones five yards apart and have the offense run 4-5 times in a row using the cones as markers designating where the center should line up. Also, the previous center cone can be used to help the running backs line up at the proper depth. Below is a video detailing this drill. At the beginning of practice, many teams will spend 5-10 minutes stretching. With my 9-10 team, I started having two kids lead the rest of the team in a 5 minute stretch. This time spent can be beneficial as it builds leadership skills in your players. However at younger ages, I do not spend time stretching during practice. We warm up with some jogs and passing and catching. I feel that the warm up drills we do will sufficiently loosen them up. This gives us more time dedicated to football drills instead of stretching. I spend about 10 minutes of each practice on some warm up drills. My goal during this time is to have each kid pass and catch at least 30 times. One warm up I always run is a two line passing drill where the kids pair up (or one group of 3). They start out about 5 yards apart and pass and catch. After a few minutes (or 10 passes each), they move back to 10 yards. Again, after a few minutes or set number of passes, they move further apart 15-20 yards. Modify the distances and/or times based on the age and abilities of your kids. With 5-6 year olds, you may have them start just a couple yards apart and instead of throwing the football the tradition way, have them toss the ball back and forth with two hand underhand passes. One frustrating thing with younger kids is that they don’t get much practice catching because the throws are often inaccurate. It turns into a drill of picking the ball up. Having them toss underhand should provide better opportunities to catch the ball. With the older kids, some practices pair them up based on ability. If groups cannot throw a 15-20 yard pass with some consistency, keep them at 10 yards. I also will rotate kids during this time so most kids have a chance to catch from one of the QBs.